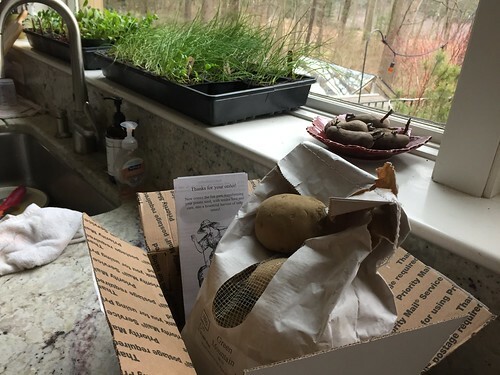 I mail ordered a box of seed potatoes (Green Mountain) from Moose Tubers and they arrived today. I was surprised it's already time for planting potatoes! Earlier, I had purchased a small box of red fingerling seed potatoes at a local garden center. They have been "chitting" on my windowsill next to the seedlings that don't fit on my plant shelves. I'll set up the new potatoes to chit too until I get time to plant, which will probably be a week or two yet. The weather is slowly warming up, but we have a lot of cold dreary rain that doesn't encourage work in the garden. Yesterday, here on the Washington coast we had a horrendous wind/rain storm... 70 mph gusts...what's next... I haven't been able to plant anything out in the garden...everything has been soggy wet for weeks and weeks... my cold frame is full, my seedling shelves are full and the weatherman says another week of rain. It has been good reading others garden work, gives me hope that spring will eventually get here.